FICO® Score 9 Now Available with CIC™! Home / FICO® Score 9 Now Available with CIC™! We’re proud to announce that we’ve upgraded our Experian credit reports to include FICO® Score 9! FICO® Score 9 is now available for all CIC™ Experian credit report users. With the switch from FICO® Score 8 to 9, you’ll want to be aware that there will be a few changes to how your rental applicant’s credit scores will be calculated. As you know, consumers with high credit scores have an easier time getting approved for loans, mortgages, and rental housing as opposed to consumers with low scores. Knowing how your rental applicant’s credit score is being calculated better equips you and your rental community for discerning how much of a financial risk an applicant is. Medical bills will no longer impact the consumer’s credit score as heavily as non-medical debt. Medical debt is not something a consumer can voluntarily sign up for, so it is not a good indicator of credit risk. The new formula now disregards any collections that have been paid off in full. Rental payment history will now be factored into the credit score (depending on if the applicant’s rental payment history has been reported to one or all the bureaus). Although FICO® Score 8 is currently the most widely used FICO Score formula in the country, we believe that the formula changes in FICO® 9 will more accurately indicate the credit risk a rental applicant poses. All Experian credit users have been automatically upgraded to FICO® Score 9 for free with CIC™. 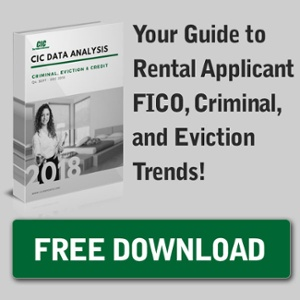 For more information about our tenant screening reports (enhanced with FICO® Score 9) visit https://www.cicreports.com/.